We represent Jawahar Navodaya Vidyalaya Yenigadale Alumni Association. 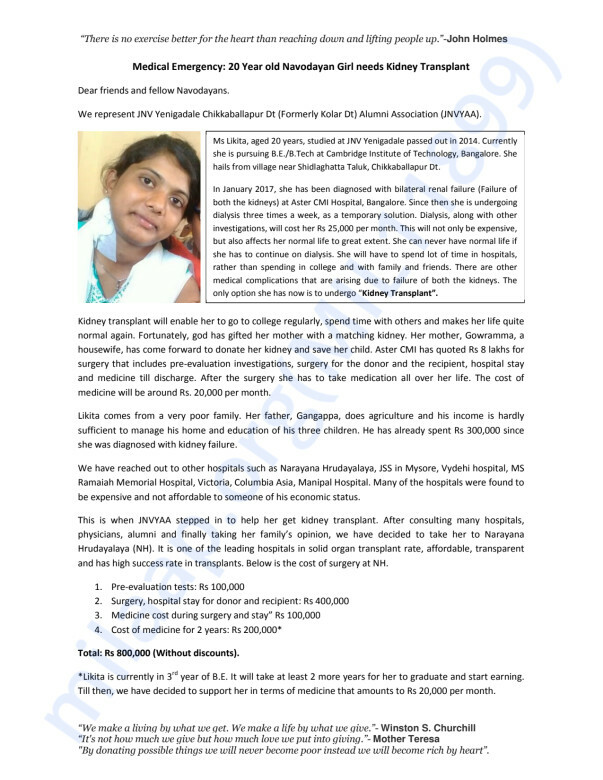 We are raising funds to support 20 year old girl, Likita G, to undergo kidney transplant in Bangalore. She is suffering from bilateral kidney failure. In January 2017, she was diagnosed with Bilateral Renal Failure at Aster Hospital, Bangalore. Since then she is undergoing dialysis three times a week. Dialysis, along with other investigations, costs her Rs 25,000 per month. 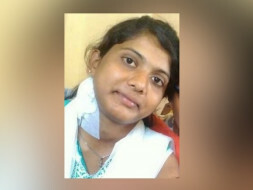 She needs to undergo a Kidney Transplant to lead a normal life. Fortunately, her mother has been found a match for the donor kidney. 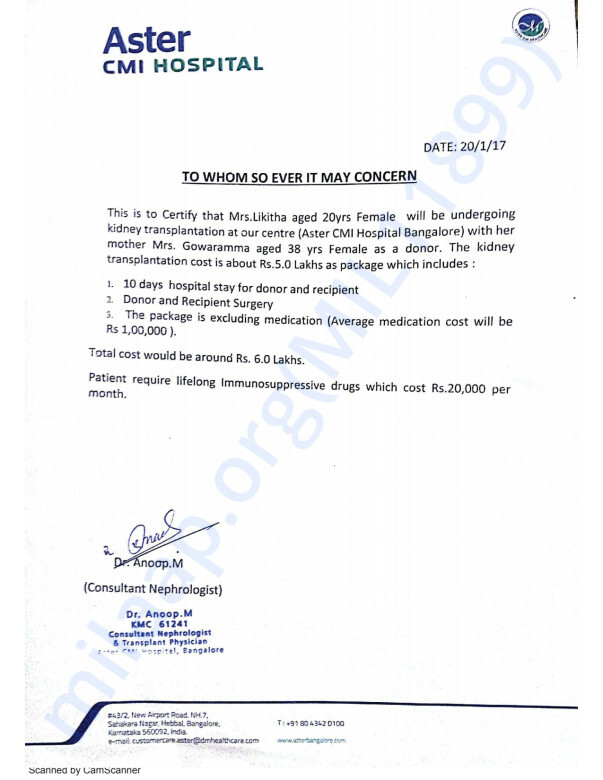 Aster CMI has quoted Rs 6 lakhs for surgery that includes pre-evaluation investigations, surgery for the donor and the recipient, hospital stay and medicine till discharge. After the surgery she has to take medication all over her life. The cost of medicine will be around Rs. 20,000 per month. Likita comes from a very poor family. Her father, Gangappa, is an agriculturalist and his income is hardly sufficient to manage his house hold expenses and education of his three children. He has already spent Rs 3,00,000 since she was diagnosed with kidney failure. We have reached out to other hospitals such as Narayana Hrudayalaya, JSS in Mysore, Vydehi hospital, MS Ramaiah Memorial Hospital, Victoria, Columbia Asia, Manipal Hospital. Many of the hospitals were found to be expensive and not affordable to someone of his economic status. After consulting many hospitals, physicians, alumni and finally taking her family’s opinion, we have decided to take her to Narayana Hrudayalaya (NH). It is one of the leading hospitals in solid organ transplant rate, affordable, transparent and has high success rate in transplants. Below is the cost of surgery at NH.